The "Texas Myth" of wide open spaces and unlimited opportunity gasps its last breath in the superb modern western "Hell or High Water." Chris Pine and Ben Foster begin the story donning ski masks to burst into a small West Texas bank and clean out the cash drawers. The armed robbers are brothers: Pine, the good boy who stayed home to nurse his dying mother... Foster, the bad boy who stood up to his abusive father with the help of a loaded gun. As the robberies continue, veteran Texas Ranger Jeff Bridges notices. He starts looking into the case with the aid of his less-than-admiring, part-Comanche partner Gil Birmingham. "Hell or High Water" gradually reveals the intent behind the crimes, as it reveals the poverty and desolation of West Texas. The myths of wide open spaces and golden opportunity masks the fact that most Texans and Westerners live in cities working at city jobs. The ranchers and farmers have grown weary of their way of life; but no one seems willing to take over for them. The new generation has headed for the big towns. "Hell or High Water" married "Bonnie and Clyde" to modern programs of fracking, reverse mortgages, open carry laws, even vaping and most of all changing times and a changing economy. Just as this land once belonged to the Indians, the current owners sense something new taking over... Banks, finance and big business. Chris Pine earns new respect as an actor at the center of this story. Ben Foster adds frightening tension. Jeff Bridges combines age and world-weariness in another award-worthy performance. 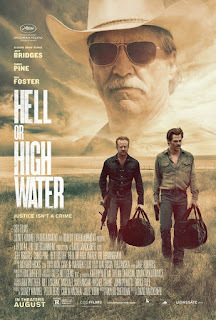 "Hell or High Water" tells a Hell of a story in one of the best films of the year. 4 Stars. Rated "R" for violence and language. Does it deliver what it promises? Compelling drama. Is it entertaining? Captures the last days of the "Texas myth" with humor and sadness. Is it worth the price of admission? One of the year's must-see movies.